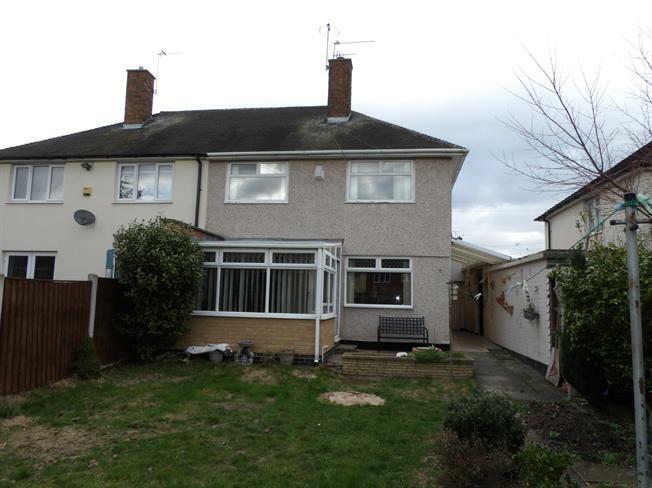 3 Bedroom End of Terrace For Sale in Nottingham for Asking Price £125,000. REDUCED FOR QUICK SALE!! OFFERS INVITED. Three bedroom semi detached family home which boasts a conservatory to the rear & two reception rooms. Briefly, the accommodation comprises; entrance hallway, living room, dining room, conservatory, fitted kitchen, three bedrooms & a shower room. Outside there is off road parking to the front, two outside sheds, outside WC & a garden to the rear with lawn, patio & shrub borders. UPVC front double glazed door. Radiator, carpeted flooring, under stairs storage cupboard, stairs to landing. Sliding double glazed door to a conservatory. Gas fire, carpeted flooring, coving to ceiling. Rear double glazed door. Tiled flooring. Double glazed window facing the front. Single glazed door to the side. Roll edge work surface, wall, base and drawer units, single sink, electric oven, gas hob, space for washing machine. Double bedroom; double glazed window facing the rear. Radiator, carpeted flooring, built-in storage cupboard, wardrobes. Single bedroom; double glazed window. Radiator, carpeted flooring. Double glazed uPVC window with obscure glass facing the side. Radiator, part tiled walls. Low level WC, walk-in shower, pedestal sink.